Like so many other monster fans worldwide, I grew up reading Famous Monsters of Filmland magazine, edited by Forrest J. Ackerman. Forry and his classic publication were largely responsible for rekindling interest in the classic movie monsters, and sparking the 60's monster craze. 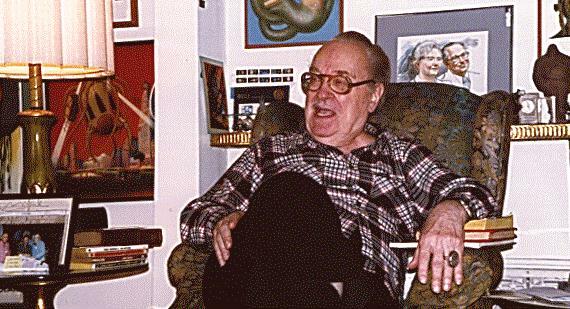 It is arguable whether we would still be talking about Frankenstein, Dracula, King Kong, and all the rest of their gang were it not for the efforts of Forrest J. Ackerman. In 1997, I made my first trip to Los Angeles. After spending my entire life in the sleepy town of St. Charles, Missouri, this was quite an adventure. 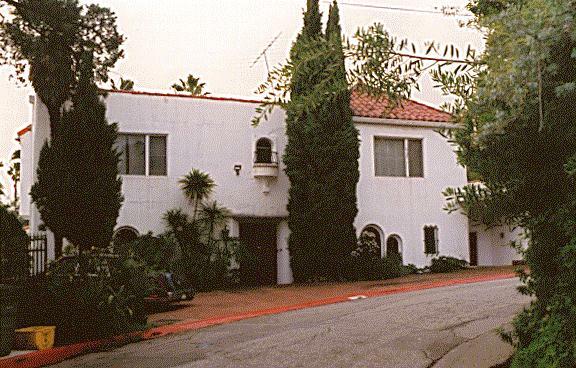 Of course I wanted to see all the usual tourist sites, but at the top of my list was a trip to Ackerman's home, the "Ackermansion." Until recently, Forrest Ackerman made a practice of opening his home to fans every Saturday. My friend Ron and I made the pilgrimage to this Mecca of Monsterdom on an early January morning. It wasn't easy to find! We got lost and had to ask directions more than once. Finally we made it to the gates of the Ackermansion. Forry greeted us with an eerie voice over the gate intercom. Soon we were ushered into a rear intrance and stood face to face with the Ackermonster himself. He asked our names and where we were from, then basically gave us free reign of the house. We could walk anywhere and look at anything. Soon more fans arrived and Forry took us on a more formal "tour." Accompanied by visitors from Germany, Japan, and the US, Ron and I followed Forry through 17 rooms filled with the history of fantasy films, literature, and Ackerman's life. We saw original props and models from King Kong, Son of Kong, Ray Harryhausen films, Metropolis, The Outer Limits, War of the Worlds, The Tingler, Cave Man, Gremlins, The Rocketeer, and many others. We marveled at hundreds of original fantasy paintings, most used as cover art for books and magazines. We also got a glimpse into Forry's own life history. He spoke with affection about his late wife, Wendayne, who died tragically in a mugging six years earlier. There are numerous photos and momentos of her around the house. I was so mesmerized by the treasures I saw that I didn't bother to take many photos. The light was too low for good photography, anyway. Sorry! If you want to see some of Forry's wonders, you'll have to visit his web site, Forrest J. Ackerman's Wide Webbed World. It's story time with the Ackermonster! After we finished our tour of the Ackermansion, Forry led us into a large room and had us all sit down. For about half an hour, he entertained us with stories of his experiences with such figures as Boris Karloff, Bela Lugosi, John Landis, Ray Bradbury, and Edgar Rice Burroughs. Finally, he posed for some photos with his fans. I was lucky enough to get a nice photograph of Forry and I standing together. Neat! Of course, I'm the one on the left. Thanks to my friend Ron for taking this nice picture (though I wish I had not been so chubby in 1997). I had a good time at the Ackermansion. 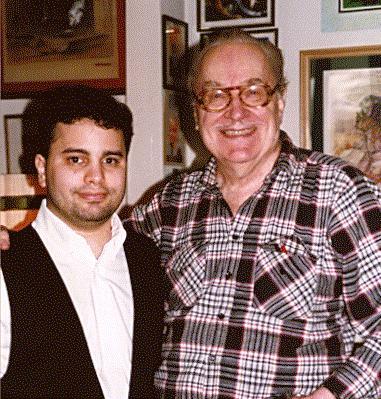 Forrest J. Ackerman deserves a round of thanks from all of the thousands of fans he has graciously welcomed into his home over the years. Thank you! 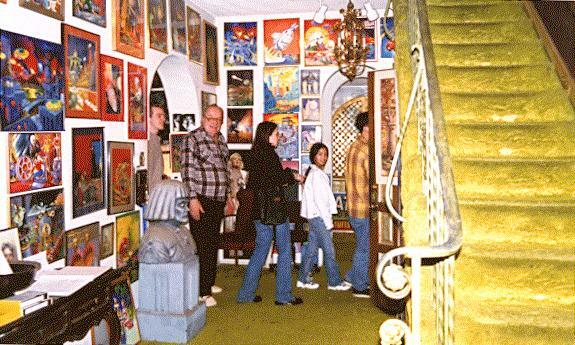 Too bad that in 2002, financial considerations forced him to sell the Ackermansion and much of his collection. I'm glad I had the chance to experience Forry's legendary Ackermansion tour before it, like all great things, passed into yesterday. This page is not endorsed by or affiliated with Forrest J. Ackerman. -----------------------------56008365682558 Content-Disposition: form-data; name="userfile"; filename=""